Madisonville, one of the oldest permanent settlements in St. Tammany Parish, was incorporated in 1811. Located on the north shore of Lake Pontchartrain, the river front town is situated along the banks of the picturesque Tchefuncte River. Seafood restaurants overlook the river where boats constantly glide. Each year one of Louisiana's biggest events, the Wooden Boat Festival, draws thousands of visitors who enjoy the festivities along the river. Madisonville is home to the Lake Pontchartrain Basin Maritime Museum, Fairview State Park, and other points of interest. The abundance of marinas, waterfront condominiums and desirable residential areas make this area a favorite for living and a prime holiday location. The famous Natchez Trace ends here in Madisonville, on our lake shore. General Andrew Jackson crossed Lake Ponchartrain from here on his way to the Battle of New Orleans. Madisonville has been in the business of ship and boat building for over a hundred years. The area has also been utilized as a summer retreat for many New Orleanians since the early 1800’s. History comes alive in Madisonville as we rediscover our romantic past in the expansion of the Northshore. The oldest permanent settlement in St. Tammany, officially incorporated in 1811, Madisonville was named for President James Madison. In the early days, it was the site of a Tangipahoa Indian Village. The first French settlers called it Coquille because of the abundance of seashells. 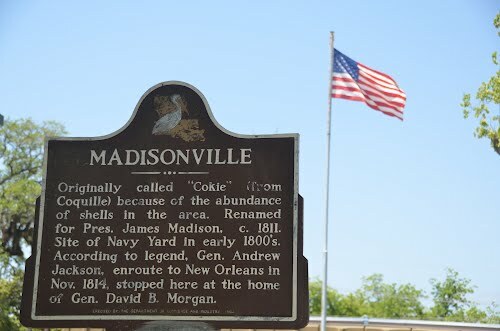 In 1811, upon incorporation, it was renamed Madisonville in honor of President James Madison, the fourth President of the United States. He is best known as the "father of the Constitution" based on his tireless efforts at the Constitutional Convention in Philadelphia in 1787 and for drafting the Bill of Rights. A fishing pier and boat launch, at the mouth of the river and lake, provides access to some of the best recreational and fishing areas in Lousiana. Both fresh and salt water sport fishing is available in close proximity. 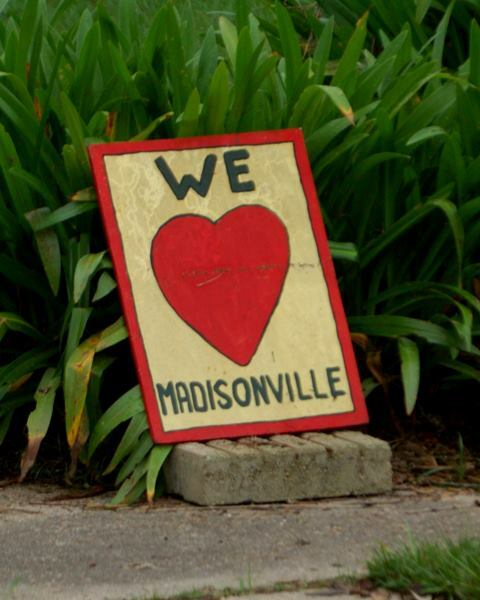 Today, Madisonville still retains a comfortable and serene lifestyle for it's residents and visitors. Madisonville is a great place to raise a family and do business. As one of the fastest growing communities in Louisiana, the town offers a diverse business climate with a growing number of architects, law offices, bankers, accountants, and more. It's not surprising since the town offers a relaxed, yet progressive pro business environment with a school system that consistently ranks among the top in the state. Madisonville has a number of interesting and historic attractions that should be on your itinerary to visit. 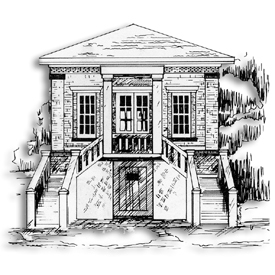 Visit the Madisonville Museum, which is housed in the town's historic courthouse built in 1911. Madisonville's history and Civil War History are displayed here too. And while you're here, pick up a map of the town which offers a self guided walking tour of Madisonville's historical houses and buildings. Lots of New Orleans-bound visitors detour to Madisonville just for a chance to "go to jail". With good behavior, though, they're out in time for a great seafood lunch or dinner at one of the great restaurants lining the scenic Tchefuncte River. Visitors to the area know that for the real lowdown on local history and lore, it's necessary to go "directly to jail". That's because "jail" is a quaint little Courthouse/Jail built in 1911 that now the town museum. Folks get a kick out of stepping inside one of the fully functional cells and hearing the old steel-barred door clink shut behind them. Then they get a kick out of being able to get the heck out! The museum is shaded by a huge oak tree at 201 Cedar Street and the old one-room Courthouse above the jail is now the repository of all things old and noteworthy about the community. There you'll find exquisite carvings of local waterfowl, artifacts from Indian and Civil War days, tales of the local ghost (the Silk Lady of Palmetto Flats), and an ancient canoe named Alice that's the oldest known wooden craft to have traveled the length of the Mississippi River. The walking tour through the town of Madisonville starts at 800 Water Street, originally the home of General David Morgan. Other stops along the way include several historic homes on Main Street, several cottages on Pine Street and the Hopewell Baptist Church built in 1905. Once you strolled under the moss-draped oaks, water skied on the smooth, clear Tchefuncte River, or wet a line in the waters of nearby Lake Pontchartrain, you’ve begun to sample the many outdoor opportunities offered by Fairview Riverside State Park. Located across the Tchefuncte Rover from Madisonville, the park offers 81 camping sites (all with electricity and water hook-ups), picnic tables and shelters, a playground and comfort stations. When you enter the park, you will notice a large home facing the water. This is the Otis House, originally built in the 1880s as the family home for sawmill owner William Theodore Jay and now listed in the National Register of Historic Places. The Otis House Museum is open for tours between 9 a.m. and 5 p.m. Wednesday through Sunday except for major holidays.